Brechin Castle Centre will only use the information you provide on this form to send you Diamond Gardeners newsletters and offers. Please tick the box below to give consent for us to send you these by email. You can change your mind at any time by clicking the unsubscribe link in the footer of any email you receive from us, or by contacting us at marketing@brechincastlecentre.co.uk. We will treat your information with respect. Your information will be securely removed should you unsubscribe from the Diamond Gardeners emails or card. By clicking below, you agree that we may process your information in accordance with these terms. The Brechin Castle Garden Centre Diamond gardeners Card entitles the authorised signatory to the six, monthly promotions and a discount of 10% on all purchases made every Tuesday* (excluding special offers, gift vouchers, stamps, food, Klass Clothing, purchases in the Coffee Shop and other products as may be specified). Cardholders must be 16 years of age or over. The card cannot be used in conjunction with any other discount card or money-off voucher or major discount promotion. The card must be presented at the time of purchase and is not transferrable. Brechin Castle Garden Centre reserve the right to change the conditions or withdraw the card without prior notice. 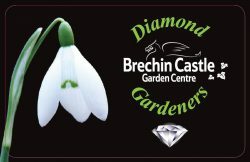 Please collect your Diamond Gardeners Card on your next visit to Brechin Castle Centre.